Broadway became alive with THE SOUND OF MUSIC - again - when its first revival of the Rodgers & Hammerstein/Lindsay & Crouse classic opened at the Martin Beck Theatre earlier this spring. ""THE SOUND OF MUSIC is back,"" cheered Jeffrey Lyons on WNBC-TV, ""and all's right with the world!"" ""This show has had a remarkable history,"" says R&H President Ted Chapin. 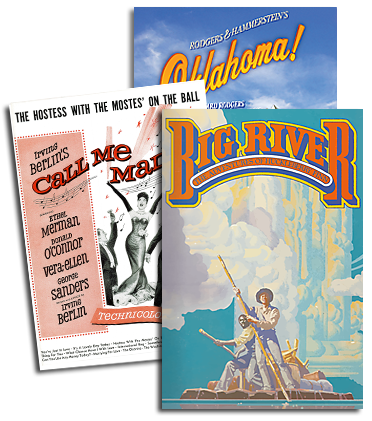 ""By our records, close to 20,000 productions have been mounted around the world since the original Mary Martin version, and of course the film is an institution unto itself. Over the last ten years or so we had several offers to bring THE SOUND OF MUSIC back to Broadway, but the pieces never quite came together."" A critically acclaimed 1990 New York City Opera version, starring Debby Boone and directed by James Hammerstein, narrowly missed making a summertime transfer, and when a hugely successful 1993-94 national tour starring Marie Osmond (again directed by Hammerstein) had the chance to nab a Broadway house, Ms. Osmond was committed to a TV series. But this time everything clicked, ""and we couldn't be more pleased,"" says Chapin. Produced under a consortium led by the trio of Steven Baruch, Richard Frankel and Tom Viertel, this SOUND OF MUSIC boasts a stellar team on and off-stage, including director Susan H. Schulman, choreographer Michael Lichtefeld, and a superb cast headed by Rebecca Luker as Maria, Michael Siberry as Captain von Trapp and Patti Cohenour as the Mother Abbess. The opening night, March 12, coincided with two significant anniversaries - one chilling, the other heartwarming: Sixty years to the day, Nazi troops marched into Austria in a maneuver known as the Anschluss, featured prominently in the musical's plot; twenty five years before that, Agathe von Trapp was born and became one of the original Trapp Family Singers upon whom the musical's story is based. This year on March 12, Agathe von Trapp celebrated her 85th birthday in grand style: along with sister Maria and brother Johannes, she attended opening night and was feted with a birthday cake at the party that followed. Opening night festivities were covered live in a two-hour TV special broadcast on WWOR-TV, hosted by Pat Collins and SPIN CITY's Richard Fine. As that special reported, THE SOUND OF MUSIC is a phenomenon unto itself. Happily, that makes THE SOUND OF MUSIC one of the few musicals immune to criticism, and this production is proving to be no exception. It is refreshing to note, however, that even those critics who stubbornly resist THE SOUND OF MUSIC (an act ""almost as bad as confessing you don't like peanut butter and jelly,"" groused Clive Barnes in the New York Post) acknowledge its impact. In the words of the New Yorker's Nancy Franklin: ""Its power cannot be denied."" for this production, even Barnes conceded that ""if you love THE SOUND OF MUSIC, this is a SOUND OF MUSIC you will almost certainly love."" ""THE SOUND OF MUSIC is a splendid entertainment,"" wrote Donald Lyons in the Wall Street Journal. ""Under Susan H. Schulman's fresh and clear direction, [it is] lit throughout by a warm and infectious generosity of spirit."" In this ""exemplary Broadway revival,"" said Jack Kroll in Newsweek, ""everything is sweet and open-hearted."" In a reference to Hallmark, the show's lead producer, Kroll added that the show is ""a gorgeous greeting card to a nicer time,"" while in the Hartford Courant Malcolm Johnson agreed: ""Hallmark has cared enough to send the very best."" ""This SOUND OF MUSIC hits a high note to the Broadway season,"" said Roma Torre on NY-1, with ""a lean, fine-tuned production that's likely to have audiences counting it as one of their favorite things."" On Fox 5, Marian Etoile Watson said, ""The passage of time has not dimmed this Rodgers and Hammerstein classic...[It is] an absolutely stunning and sumptuous production with costumes and sets that almost take the breath away."" Bob Feldberg in the Bergen Record acknowledged the twin peaks of Tony- and Oscar-winning predecessors that this production would have to climb but said it ""doesn't rest on their laurels. It has loads of appeal that is entirely its own...A bright, lively and altogether winning version, as freshly minted as any brand new show."" Rebecca Luker had imposing predecessors of her own to follow, but she more than held her own. ""Rebecca Luker is true and wonderful,"" wrote the Hartford Courant's Malcolm Johnson. ""She far surpasses Mary Martin and perhaps even Julie Andrews."" On Fox 5, Marian Etoile Watson said, ""Yes Mary Martin was great, yes Julie Andrews was magnificent, but Rebecca Luker makes the role her own."" In the New York Times Ben Brantley stated, ""Her light soprano is as fetching as ever, and she makes the part her own."" Kroll in Newsweek used one word to describe her performance - ""irresistible"" - while John Heilpern in the New York Observer used three - ""charming, charming, and charming."" Almost in unison, a quartet of critics praised Luker's ""lovely voice"" (Lyons), her ""heavenly voice"" (Torre), her ""silvery voice"" (Sommers, Newark Star Ledger), and her ""voice of gold"" (Hamburg, WOR Radio). For many, THE SOUND OF MUSIC on stage or on screen was one of their earliest visceral experiences, and the producers of this revival have not been shy in suggesting that it is a legacy worth passing on. ""It seems to strike deep responsive chords in the very young,"" wrote Brantley in the New York Times. ""I can personally confirm this, having seen the movie at least half a dozen times when I was 10, and I know every lyric by heart."" In an article he wrote earlier this season, the Newark Star-Ledger's Michael Sommers described a childhood trip he took to New York to see his first Broadway show - THE SOUND OF MUSIC starring Mary Martin. Coming to Broadway's first revival nearly 40 years later, Sommers wasn't disappointed. ""I watched THE SOUND OF MUSIC through a nostalgic haze - you will, too, if you've grown up on this show,"" he wrote. ""The warm-hearted appeal of Richard Rodgers' glorious melodies and the feelings stirred up by Oscar Hammerstein's thoughtful lyrics give this family classic a glow that lasts long after the final curtain. Yes, it remains a great story...the everlasting magic of Rodgers & Hammerstein's artistry still satisfies an audience no end. Sure,"" he concluded, ""take the kids."" THE SOUND OF MUSIC is currently playing at Broadway's Martin Beck Theatre; for tickets and information call Tele-Charge at 212/239-6200 or from outside metro New York at 800/432-7250... The 1998 Broadway cast recording of THE SOUND OF MUSIC was released by RCA Victor in May, and a Broadway Souvenir Folio Edition of the songbook will be published by Williamson Music later this summer...For more on this production, visit www.TheSoundOfMusic.com, or link to it from our SOUND OF MUSIC page at www.rnh.com."